Carl Friedrich Gauss was the last man who knew of all mathematics. He was probably the greatest mathematician the world has ever known – although perhaps Archimedes, Isaac Newton, and Leonhard Euler also have legitimate claims to the title. Gauss’s published works are remarkable. At the age of just 21 he wrote Disquisitiones Arithmeticae, whose importance to number theory has been likened to the importance of Euclid’s Elements to geometry. In addition to mathematics, Gauss made powerful contributions to a wide range of mathematical and physical sciences including astronomy, optics, electricity, magnetism, statistics, and surveying. Johann Carl Friedrich Gauss was born on April 30, 1777 in the city of Brunswick, Germany. His mother was Dorothea Benze and his father was Gebhard Dietrich Gauss. Carl’s mother was intelligent, but illiterate; she had received no education was a housemaid before marriage. Carl’s father made ends meet any way he could, working at different times as a sales assistant, butcher, bricklayer, gardener, and treasurer for a local insurance company. Money was always in short supply. Carl had an older half-brother, Georg, from his father’s first marriage, which ended when his first wife died. From the very beginning, Carl showed an unusual talent for numbers; he could calculate before he learned to speak. In 1782, age seven, Carl started at St. Katherine’s Public School. In later life he would tell humorous tales of how he bewildered his teacher, calculating faster than the better-educated Mr Büttner could. Mr Büttner had the good grace to order an advanced arithmetic book, and the 8-year-old Carl quickly devoured its exercises. Although Carl came from a simple peasant family, Mr Büttner recognized that one day the boy could become a professor at a great university – if someone gave him the chance. Mr Büttner invited Carl’s father to school to discuss his son’s future. Carl’s father was not convinced – his horizons were very limited. He hoped Carl would become a laborer and help support the family. Mr Büttner assured him that his son’s talents were so unusual that money would be found from a wealthy donor for the boy to continue his education. Carl’s father agreed to this, excusing the boy from his part-time job spinning flax. Carl began to be tutored by Martin Bartels, his elder by eight years, well-educated, and a talented mathematician. Soon Bartels was inspired by his student to devote his own career entirely to mathematics, eventually becoming a professor. The two would be friends for life. By the time he was 10, Carl had independently derived the binomial theorem – a truly remarkable feat. Word of the young genius reached the ears of the Duke of Brunswick, who generously agreed to fund his education. In 1788, age 11, Carl began at the Martino-Katharineum grammar school, where he excelled in Mathematics, Ancient Greek, Latin, and Modern Languages. In 1792, age 15, supported by the Duke, Carl entered the Caroline College. By the time he was 18, he had completed his degree in mathematics. He dug unusually deeply into the subject. He was particularly passionate about developments made by Isaac Newton, Leonhard Euler, and Joseph-Louis Lagrange. His hero was Archimedes. Gauss studied for a doctorate at the University of Göttingen for three years, beginning in October 1795. He was already far ahead of most mathematics professors in both breadth and depth of expertise. Göttingen, with its magnificent library collections, was his perfect home. He immersed himself in modern mathematics. He also attended lectures in linguistics, physics, and astronomy. He actually borrowed more humanities books from the library than mathematics books. Although he knew his abilities were special, his fellow students did not see him as the wholly devoted and brilliant mathematician that he was. They regarded him as modest and normal. While studying at Göttingen, Gauss’s outpouring of new ideas changed mathematics forever. After just six months, Gauss solved a problem that had stymied mathematicians for 2,000 years – the construction of a regular 17-sided figure, the heptadecagon, by straightedge and compass alone. With his discovery of the heptadecagon’s construction, Gauss realized that his place in history as a mathematician of the highest rank was assured. Naturally, having mastered Ancient Greek, the 19-year-old Gauss spelled out ‘Eureka’ as Archimedes would have. Gauss was perhaps the last person to master every aspect of mathematics. 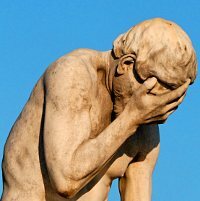 Today, even someone as gifted as Gauss cannot know all of mathematics; the subject has grown too large. In his time as a student, Gauss made many momentous discoveries in number theory, such as the one above. The Duke of Brunswick continued to fund Gauss’s work, so he was free to delve into any fields that interested him. In 1801, age 24, he published one of the greatest works in the history of mathematics – Disquisitiones Arithmeticae. He chose to write the book in perfect classical Latin, writing most of it three years before it was published. In it he recorded formal proofs of many of his earlier discoveries. Disquisitiones Arithmeticae unified the separate strands of number theory. It is where modern number theory begins. Gauss documented significant breakthroughs, such the law of quadratic reciprocity, his formulation of modern modular arithmetic, and congruence – the idea that underpinned his unified approach to number theory. Admirers said Gauss had done for number theory what Euclid did for geometry. On January 1, 1801, Giuseppe Piazzi in Italy discovered a new heavenly body. He did not know what he had found, other than it was very faint, starlike, and not in his star catalog. Over the next few nights he watched the object move slightly among the background stars. Giuseppe Piazzi was the only person ever to observe Ceres, but he lost it. It was found again after Gauss, using his own mathematical methods, calculated its location. Image courtesy NASA/JPL-Caltech. He started believing he had discovered a comet, but, by January 24, he was puzzled. The object didn’t look like a comet and was moving too slowly. Piazzi observed it for 6 weeks, during which time it moved 3 degrees across the sky. He then fell seriously ill. By the time he recovered, he had lost it. Alarmingly, no astronomer could find it again, so they asked for mathematical help. 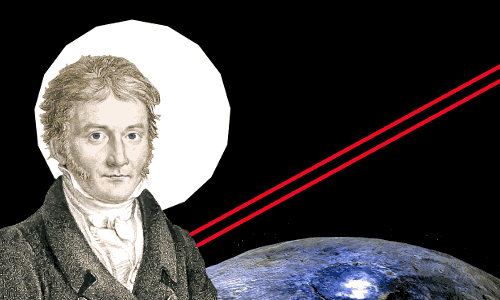 In the end, only one man could help – the 24-year-old Gauss, who invented a new method of calculating orbits from a minimum number of observations. Not only did Gauss locate the lost body, he also showed its orbit was almost circular, like a planet, and he calculated how far the object was from the sun. 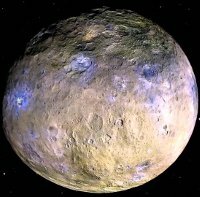 The object, named Ceres, turned out to be an entirely new class of object – an asteroid, or in modern jargon, a dwarf planet. With Gauss’s rediscovery of Ceres came well-deserved international fame. Modestly, Gauss heaped praise for the rediscovery on Isaac Newton’s theory of gravitation and Newton’s book Principia. Gauss believed Newton was the greatest mathematician ever. But Gauss had gone beyond Newton. During his extensive program of work to solve the Ceres mystery he deployed two very powerful new mathematical methods he invented: the method of least squares, and the fast Fourier transform. More than two centuries later, these methods are still essential scientific tools. In 1806, the Duke of Brunswick died. His financial support for Gauss died too. The following year, Gauss accepted the Chair of Astronomy at Göttingen, which he held for the rest of his life. Gauss took his new astronomy job seriously, regularly using his telescope to observe the night sky – he actually enjoyed this enormously. 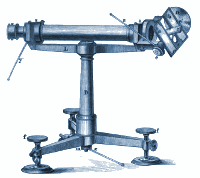 He made several practical improvements to astronomical instruments and oversaw the building of a new observatory. In his later years, Gauss started to enjoy teaching students – not because his views had changed, but because the quality of students improved; it wasn’t just the ABCs he was teaching. His presence at Göttingen acted like a magnet, attracting elite students such as Bernhard Riemann and Richard Dedekind. In time Göttingen became the center of mathematics, not just in Germany, but the world. Gauss’s approach to issuing academic papers was ‘few, but ripe.’ He was a perfectionist, who only published works he believed were flawless. Many highly significant breakthroughs he made remained unpublished until after his death. In his early years as a professor he released papers dealing with series, integrals, and statistics. He also began looking very seriously at potential theory and solving partial differential equations – these equations have numerous applications in physics, including electromagnetism and gravitation. In 1809 he published an important two-volume work on the motion of heavenly bodies – Theory of Motion of the Celestial Bodies. Gauss invented the heliotrope in 1821. He had become involved in land surveys for map-making and saw the importance of recording far-separated positions with great accuracy. The heliotrope is a mirror that reflects the sun’s rays over very long distances. Its drawback is it can only be used in bright sunshine. Heliotropes were used in land surveys in Germany for over 150 years. They were also used to survey the USA. As a young man, Gauss found he could not keep up with the flow of mathematical ideas pouring unabated into his mind. He chose not to publish some material that he felt was too far ahead of his time – such as Non-Euclidean geometry. Gauss said he had no wish to waste his precious time having pointless arguments with people who could not fully understand his work. In 1831, Gauss began to apply mathematical potential theory to the real world. The 54-year-old mathematician helped the 27-year-old physicist Wilhelm Weber to get a physics chair at Göttingen and then worked with him on electricity and magnetism. In 1832, with Weber’s assistance, Gauss carried out experiments whose results allowed him to define the earth’s magnetic field using units of millimeters, grams, and seconds. In other words he showed the earth’s magnetic field can be defined using purely mechanical dimensions – mass, length, and time. The work provided strong impetus for the use of SI units. In 1833, Gauss and Weber invented one of the world’s first telegraph systems. They also invented a binary alphabet code, enabling communication between Weber’s physics building and Gauss’s astronomical observatory about 1.5 miles (2.5 km) apart. By 1835, their telegraph lines had been installed beside Germany’s first railroad. In 1833, Gauss and Weber discovered how voltage and current are distributed in the branches of electric circuits: voltage is governed by the law of conservation of energy, and current by the law of conservation of charge. Gustav Kirchoff rediscovered the laws in 1845, and they now bear his name. Gauss’s Law (for electric fields and charges) and Gauss’s Law for Magnetism. Written mathematically, these laws form two of the four equations needed to combine the electric and magnetic fields into a single, unified electromagnetic field. The unification was achieved by James Clerk Maxwell in 1864. Gauss’s incredible calculating power allowed him to find patterns in numbers more readily than most mathematicians. It enabled him to discover the prime number theorem when he was a teenager. As was so often the case, he did not publish his discovery. the normal distribution/bell curve is often called the Gaussian distribution, because Gauss discovered it. although not the first person to use complex numbers, he defined them, establishing the modern notation, and he applied complex numbers to solve problems in science. he opened up the field of differential geometry and published the Theorema Egregium, relating surface curvature to distances and angles. he became a financial wizard after accepting the public duty of managing the Göttingen’s widows’ fund. As a result of his financial ingenuity he became wealthy, leaving an estate worth almost 200 times his annual salary. Putting this in a modern context, someone today earning, for example, $50,000 a year would end up with assets of almost $10 million. Gauss was reported to be a generally good natured man. He lived simply despite the wealth he accumulated. He hated traveling and after becoming Chair of Astronomy left Göttingen only once in 48 years – to go to a conference in Berlin. He was passionate about literature and fact-gathering, and his sole indulgence was a personal library stocked with 6,000 books written in the languages he had mastered including Danish, English, French, Greek, Latin, Russian, and his native German. In October 1805, age 28, he married Johanna Osthoff. They had three children: Joseph, who became an army officer; Wilhelmina, who married an academic, and Louis, who died at the age of 5 months. Sadly Gauss’s wife Johanna died in October 1809, a month after Louis’s birth. In October 1810, Gauss married Johanna’s best friend Wilhelmina. They had three children: Eugene, who became a businessman in America; Wilhelm, who also became a businessman in America; and Therese, who kept house for her father until the end of his life, then married an artist. Gauss’s beloved mother lived to the age of 97. She lived in her son’s home for the last 20 years of her life, receiving his devoted personal care. Carl Friedrich Gauss died peacefully in his sleep in Göttingen on February 23, 1855. He was 77 years old. He was buried minus his brain in Göttingen’s Albanifriedhof Cemetery, close to the university. His brain was preserved and stored in Göttingen’s physiology department. It is still there today. In his later years, Gauss remained so proud of his youthful heptadecagon achievement that he asked for the shape to carved on his tombstone, just as Archimedes had a sphere inside a cylinder carved on his. 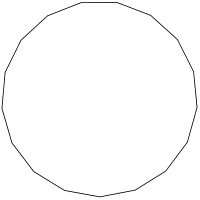 Sadly, his wish was not fulfilled – the stonemason said it would be too difficult to carve a heptadecagon that didn’t resemble a circle. However, his home city of Brunswick erected a memorial in Gauss’s honor and this does have a heptadecagon inscribed on it. "Carl Friedrich Gauss." Famous Scientists. famousscientists.org. 25 Jul. 2016. Web.